Sundays. I have a friend that claims Sunday is her favourite day of the week, now that she’s a mother, because it means the next day is Monday and she can go back to work. I wish I could love Sundays as much, but Sunday simply represents the start of another work week. I want to make the most of my Sundays, and that includes eating something delicious. Yesterday was a scorcher, so we didn’t want to turn on the oven. Hubs suggested steak, but I’m cutting back on red meat, so we decided to see what we could find at the grocery store. We came home with dressed trout. At the store, I’m staring at the fish from various angles, trying to figure out what could be stuffed in its belly to make it “dressed”. 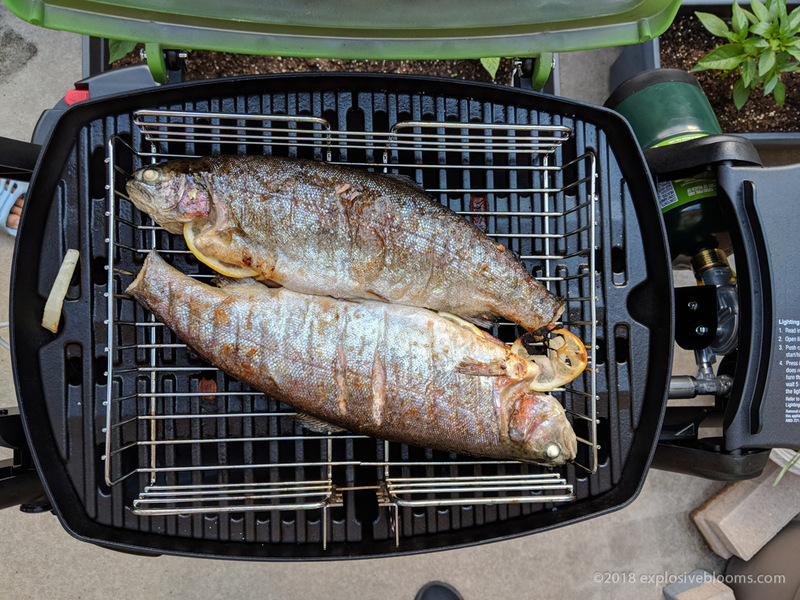 Hubs was curious too, but then thought (correctly) that it might be a less scary way of saying “whole fish”, because people might be grossed out by the idea of taking home a fish with a head and a tail. I don’t understand why anyone would be freaked out. In fact, the term dressed is so confusing! If it doesn’t mean seasoned, it sounds like the fish is wearing a tuxedo, and who wants to buy a fish wearing a tuxedo?! Anyway, when we got home, we looked in the belly and it wasn’t stuffed with anything. 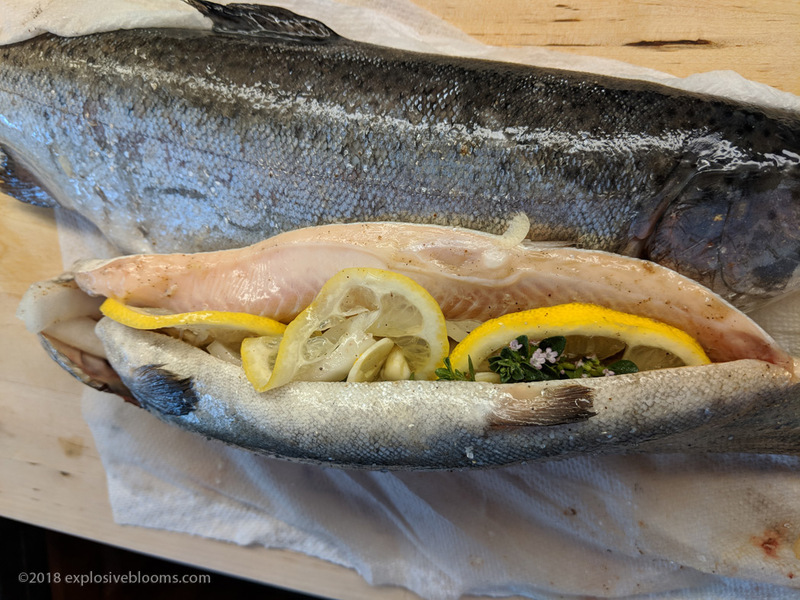 Dressed = whole fish. Hubs got to work chopping onions, while I sliced lemons and garlic, and cut some sprigs of lemon thyme and pineapple sage from our garden. 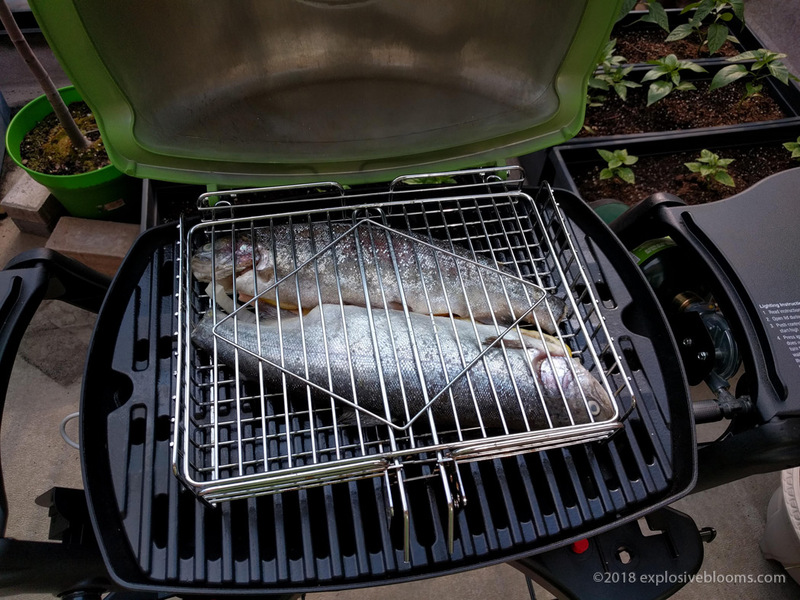 After adding some salt and pepper, hubs stuffed everything into the belly and placed the two fish into the grilling basket. Our fish were a little long, so the tails had to be trimmed. As the fish was grilling, I pan fried some zucchini, and steamed some rapini. We had splurged and picked up some jamón ibérico, just because. We were perfectly in sync. 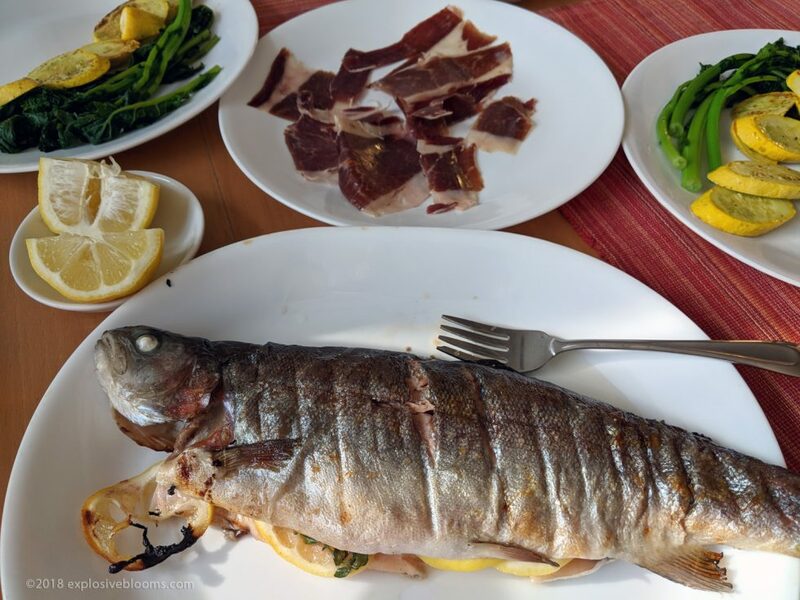 As the fish was coming off the grill, my rapini was being finished with a dash of sesame oil. 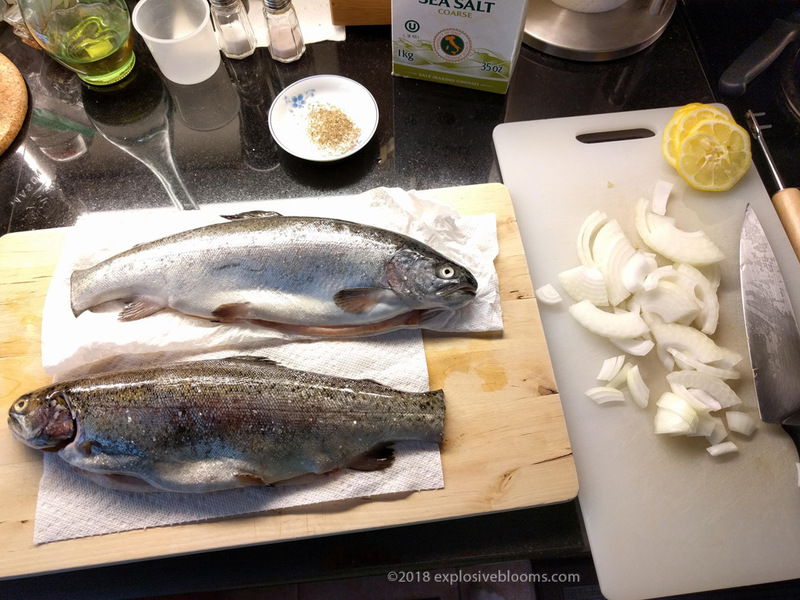 The trout was perfectly grilled, and tasted so good with a little bit of salt, a squeeze of lemon juice, and a drizzle of olive oil. The slight bitterness of the rapini was excellent with the fish. 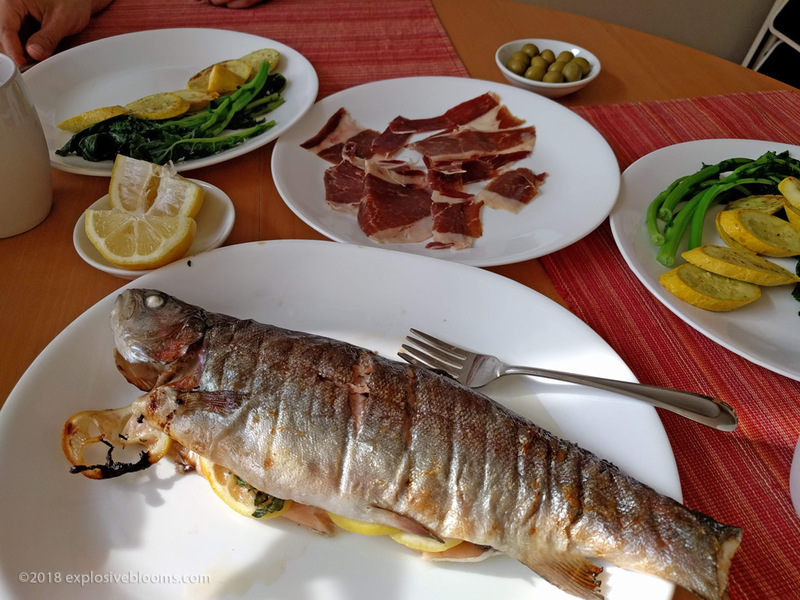 The saltiness of the Spanish olives cleansed the fish flavour from our palates before we let the thin slices of jamón melt in our mouths. A light white wine would have been divine with our dinner, but I wanted to go for a bike ride afterwards. We ended up riding for about 1.5 hours. As the sun was setting, it was the right temperature for riding. What a wonderful way to close out another Sunday.